For the first time, a team of chemists and engineers at Penn State University have placed tiny synthetic motors inside live human cells, propelled them with ultrasonic waves and steered them magnetically. It's not exactly "Fantastic Voyage," but it's close. The nanomotors, which are rocket-shaped metal particles, move around inside the cells, spinning and battering against the cell membrane. "As these nanomotors move around and bump into structures inside the cells, the live cells show internal mechanical responses that no one has seen before," said Tom Mallouk, Evan Pugh Professor of Materials Chemistry and Physics at Penn State. "This research is a vivid demonstration that it may be possible to use synthetic nanomotors to study cell biology in new ways. We might be able to use nanomotors to treat cancer and other diseases by mechanically manipulating cells from the inside. Nanomotors could perform intracellular surgery and deliver drugs noninvasively to living tissues." The researchers' findings will be published in Angewandte Chemie International Edition on 10 February 2014. In addition to Mallouk, co-authors include Penn State researchers Wei Wang, Sixing Li, Suzanne Ahmed, and Tony Jun Huang, as well as Lamar Mair of Weinberg Medical Physics in Maryland U.S.A.
Up until now, Mallouk said, nanomotors have been studied only "in vitro" in a laboratory apparatus, not in living human cells. Chemically powered nanomotors first were developed ten years ago at Penn State by a team that included chemist Ayusman Sen and physicist Vincent Crespi, in addition to Mallouk. "Our first-generation motors required toxic fuels and they would not move in biological fluid, so we couldn't study them in human cells," Mallouk said. "That limitation was a serious problem." When Mallouk and French physicist Mauricio Hoyos discovered that nanomotors could be powered by ultrasonic waves, the door was open to studying the motors in living systems. A demonstration of very active gold nanorods internalized inside HeLa cells in an acoustic field. This video was taken under 1000X magnification in the bright field, with most of the incoming light blocked at the aperture. For their experiments, the team uses HeLa cells, an immortal line of human cervical cancer cells that typically is used in research studies. These cells ingest the nanomotors, which then move around within the cell tissue, powered by ultrasonic waves. At low ultrasonic power, Mallouk explained, the nanomotors have little effect on the cells. But when the power is increased, the nanomotors spring into action, moving around and bumping into organelles—structures within a cell that perform specific functions. The nanomotors can act as egg beaters to essentially homogenize the cell's contents, or they can act as battering rams to actually puncture the cell membrane. 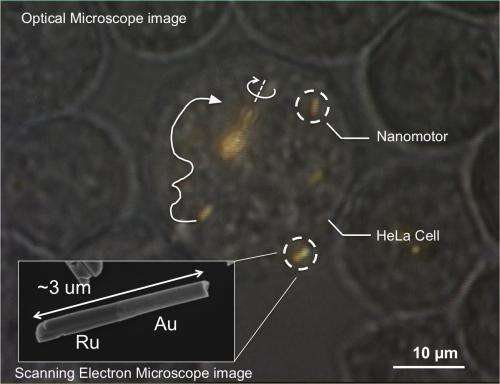 Dark particles in a HeLa cell interact with spinning gold nanorods. This video was taken under 1000X magnification in bright field, with most of the incoming light blocked at the aperture. While ultrasound pulses control whether the nanomotors spin around or whether they move forward, the researchers can control the motors even further by steering them, using magnetic forces. Mallouk and his colleagues also found that the nanomotors can move autonomously—independently of one another—an ability that is important for future applications. "Autonomous motion might help nanomotors selectively destroy the cells that engulf them," Mallouk said. "If you want these motors to seek out and destroy cancer cells, for example, it's better to have them move independently. You don't want a whole mass of them going in one direction." Gold nanorods move along the edge of the membrane of a HeLa cell. This video was taken under 1000X magnification in bright field, with most of the incoming light blocked at the aperture. The interactions between gold nanorods and polystyrene tracer particles, gold nanorods and red blood cells. The video was taken under 500X overall magnification. The video of polystyrene tracer particles was taken in bright field mode, while the video of red blood cells was taken in dark field. The ability of nanomotors to affect living cells holds promise for medicine, Mallouk said. "One dream application of ours is Fantastic Voyage-style medicine, where nanomotors would cruise around inside the body, communicating with each other and performing various kinds of diagnoses and therapy. There are lots of applications for controlling particles on this small scale, and understanding how it works is what's driving us." It looks chaotic more than controled under the stimulation, and stirring all around ? Every bacteria or sperm cell with flagellum is a wonderful complex nanomotor, or nanorobot and it remains to find how to control or program them to move as we want !! Certainly we will be able to make real this dream in less than one century.